Okra, figs and peaches - all pickleable and all delicious. Preserving summer the Israeli way means spicy pickled okra, stuffed baby eggplants with garlic and herbs, pickled watermelon peel and, of course, crispy small cucumbers in brine. It also means figs jam, apricot preserves in alcohol, watermelon peel jelly and even eggplant jam. In these preserves you’ll find bold flavors and bright colors, just like summer itself. 1. Wash okra, do not trim, set aside. 2. Bring a large pot of water to boil and sterilize a 2 liter glass jar. 3. Put apple sider vinegar, sugar and salt in a pot and bring to boil over medium-high heat. Add okra and cook for 3 minutes, mixing occasionally, until all okra changes color to olive-green. Remove from heat. 4. 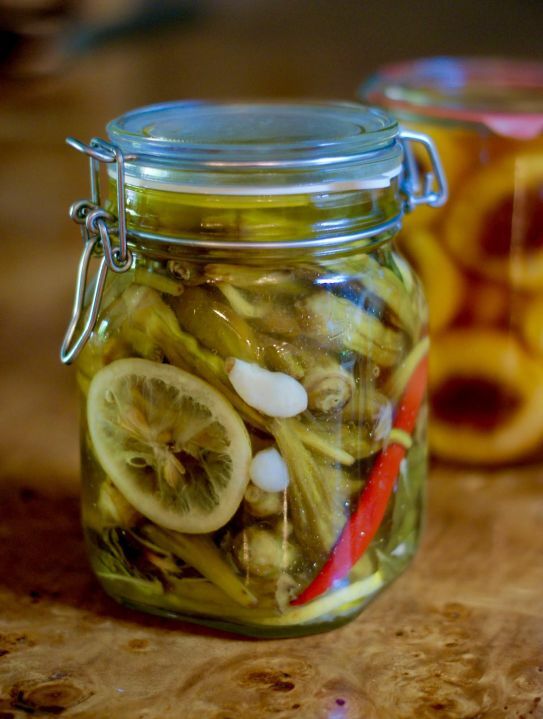 Arrange a few slices of lemon on the bottom of the glass jar, add a few garlic cloves and mint leaves, then use tongs to arrange a third of the okra on top. Repeat with layers of lemon slices, garlic and mint before adding another third of the okra, until you finish all ingredients. End with a layer of lemon slices. 5. Pour the vinegar mixture into jar to cover okra, shake jar to remove air bubbles. Add boiling water if you need to cover okra. 6. Keep in a cool place away from direct sun light. Okra will be ready in about two weeks. Arak is a Levantine anise flavored alcoholic drink, similar to Ouzo, Sambuca or Pastis. Use any of these to make the simple infused spirit. Arak is available in some liquor stores. Serve infused arak the same way regular arak is served in the Middle East. Add a little water to dilute and serve over ice. 1. 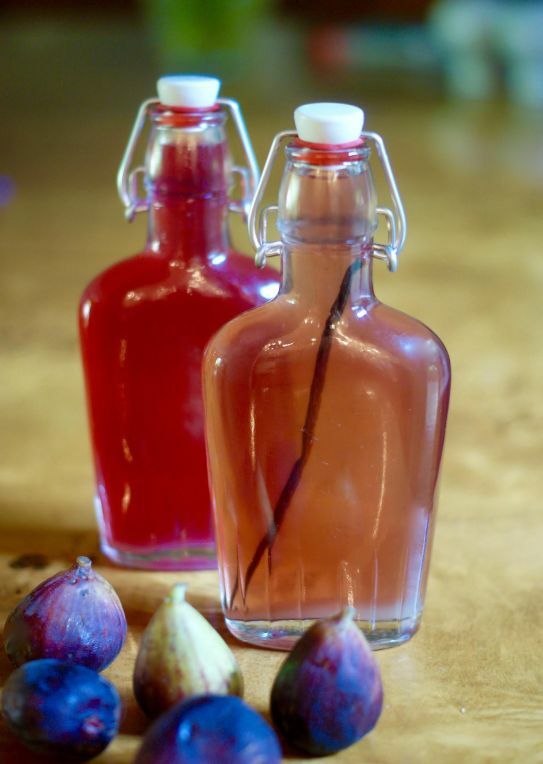 Put figs in a large glass jar, cover with Arak, then add vanilla bean in the center of the jar. Cover with lid. Let stand in a dark cool place for a week, shaking the jar once a day. 2. Strain fig-arak through fine sieve and discard figs. Sterilize a glass bottle with boiling water, then pour infused arak into bottle together with the washed vanilla bean. 3. Infused arak can keep for a year. A Perfect gift to your Rosh Hashanah hosts. 1. Put pomegranate seeds in a large glass jar, then gently crush seeds with a pestle to bring some of the juice out. Cover with Arak and put lid on. Let stand in a dark cool place for a week, shaking the jar once a day. 2. Strain pomegranate-arak through fine sieve and discard pomegranate seeds. Sterilize a glass bottle with boiling water, then pour infused arak into bottle. Mastic gum, mastica or Tears of Chios is a tree resin with a light pine-nut aroma. It is used in the Middle East, Turkey and Greece to thicken desserts and to make mastika liquor. It helps thicken jams while adding a nice aroma, but you can substitute with pectin or with an apple core and seeds wrapped in cheesecloth. Mastic gum is available at some Middle Eastern markets and online. 1. Peel peaches with a vegetable peeler. If peaches are too soft and don’t peel easily, slice a shallow X at the bottom of each peach and then blanch them in boiling water for a couple of minutes, Transfer to a colander and wash in cold water, then pull of skin. 2. Halve peaches and remove pit. 3. Bring a large pot of water to boil and sterilize a 24 oz. glass jar. 4. Bring water and sugar to boil in medium pot over medium-high heat. Crush mastic gum with a little sugar using mortar and pestle and set aside.Add vanilla bean and halved peaches and cook for 5 minutes, making sure all peaches are covered in syrup. Transfer peaches with a slotted spoon into a bowl. Add crushed mastic gum to syrup and cook until syrup has thickened, about 5 minutes longer. Check it as you would check any jam for doneness - spoon a little of the syrup on a cold plate, move your finger in the syrup and if it leaves a mark that stays for a couple of seconds, the syrup is thick enough. 5. 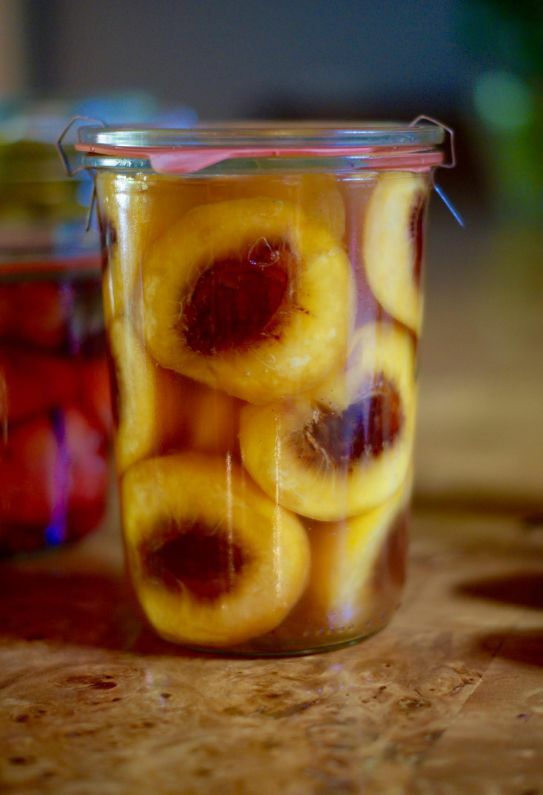 Arrange peaches nicely in the jar, then pour sugar syrup to cover up to of the apricots. Add brandy to the last third of the jar, then use a wooden skewer (chopsticks work well) to stir peaches a little in order to remove air bubbles. Add more of the syrup, if needed, to cover peaches completely, then seal jar. 6. Peaches are ready to serve after a couple of weeks stored in the refrigerator. They’re great over ice cream.